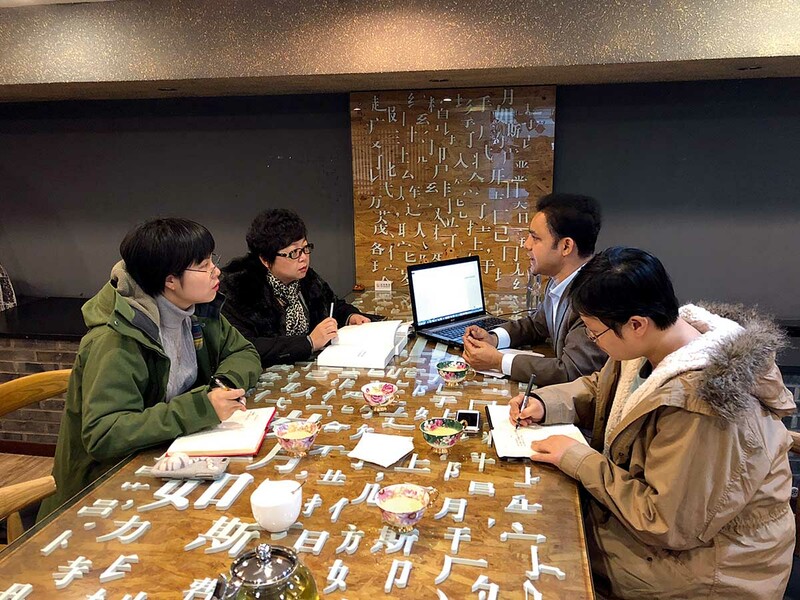 Kishore Biswas (second right) works with professional Chinese and Bengali translators at China Radio International to translate the book Xi Jinping: The Governance of China. In the seventh grade, I became enchanted with a new art teacher who opened a window for me to learn about Chinese art, culture and history. Interestingly, the very Chinese characters engraved on my art pencil and ruler, as on most Chinese products exported to this day, caught my curious eyes. I even managed to write those alien versions of mighty hieroglyphics—“中国制造” (Made in China), when I was 11.
Who could have guessed that such a mundane Chinese window in high school would expand into a stable doorway later in my life? Nearly two decades have passed since I first visited China at the dawn of the millennium. I was fascinated by the big ceramic flower vases and the large portrait of the Great Wall at the Chinese Embassy in Bangladesh. And soon after my first step on Chinese soil, I took the Chinese government scholarship exam. I was lucky enough to be offered a scholarship to study in the top two universities in China: I earned my bachelor’s degree at Tsinghua University and a master’s degree and Ph.D. at Peking University. Such a journey was not easy at first. Learning a new language, adapting to a new environment and understanding a whole new education system knocked me way down to earth from my sky-high dreams. I spent most of my college life with Chinese classmates. They were friendly and talented. They helped me with my studies, language barriers and day-to-day problems in the foreign land. My major and field of research throughout undergraduate and graduate schools mostly stayed in the Computer Science realm, but I tried to learn a little more than just academic knowledge alongside my classroom and lab work. I decided to utilize every opportunity to learn about the people around me—about their culture, their thought processes and their perspective on the world. Gradually I was able to participate in several TV shows and media programs including the famous “Chinese Bridge” competition for foreign students in China. I made it through the finals and won the gold medal in 2009. I discovered that the more I learned about Chinese culture and history, the more I fell in love with China. But occasionally, cultural differences, and even misunderstandings, between my home country and China have worried me. Most of my friends and relatives in Bangladesh still have a limited impression of China. The same is true of my Chinese friends toward Bangladesh. I try to tell my fellow nationals: China is a more diverse and colorful country than just flying kung fu heroes and unusual food. I try to introduce them to modern China and its advanced technology and lifestyles. I have also encouraged my Chinese friends to visit Bangladesh and enjoy its unique cultural taste, natural beauty and hospitality. I realized more action is needed than just words. 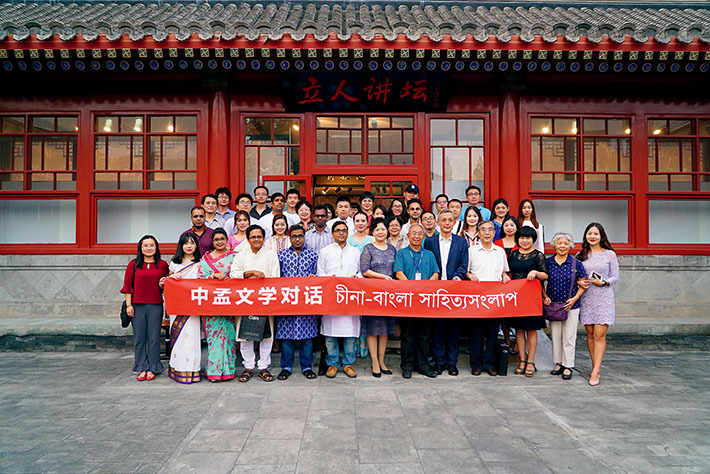 September 9, 2017: Participants of the China-Bangladesh Dialogue of Literature pose for a group photo in a former residence of late Chinese literary giant Lu Xun and his brother in Beijing. The event was jointly organized by China Radio International and China Publication Association. I felt the urge to clear up misinformation and rumors from both sides, so I started writing a book on China-Bangladesh cultural differences, part of which was published in the art pages of a leading Bangladeshi newspaper, BDNews24. I received positive feedback from readers, and that encouraged my writing. I love poetry. Ancient Chinese poems, especially those from the Tang Dynasty (618-907), are attractive to me. In hopes of sharing that literary treasure with Bangladeshi readers, I started translating Chinese verses into Bengali poems, which were also published in Bangladeshi newspapers and magazines. I enjoyed my role as a bridge between Chinese and Bangladeshi cultures. During my work at Peking University, I was encouraged to translate some Chinese books into Bengali with government sponsorship. I worked with a group at China Radio International to translate the renowned book Xi Jinping: The Governance of China, and its Bengali version was published in Bangladesh last year. Both sides of the Himalayas have been enriched by two of the world’s earliest civilizations—China and the Indian subcontinent. The two cultures have a long history of bilateral exchange. Although most people living today in South Asia and China know comparatively little about each other’s language and culture, the past decade has seen the wind starting to change direction. Cooperation in politics, economics, culture and education between China and South Asian countries is on a dramatic rise today after the proposal of the Belt and Road Initiative by President Xi Jinping. This change inspires the need for better understanding among the three billion people of both sides. They need to overcome miscommunication brought by cultural differences and language barriers to achieve better cooperation. The Belt and Road Initiative is facilitating cultural exchange to connect more people around the globe. The author is a Bangladeshi publisher and former foreign expert at the Foreign Studies Department of Peking University.